The NotShort blog is restarting in 2013. Let's hope some content appears . 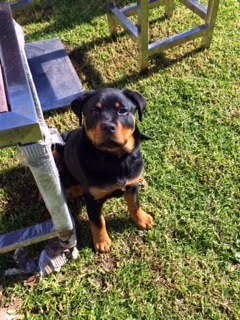 . .
Rozy is the new member of the Long family, a pure-bred Rottweiler. One of the consequences of being overseas for so long is you find there are big holes in your local media knowledge, whether it's TV shows, books or even events that totally by-passed you. In my case I was away for most of the decade from 1998-2008 -- in Hong Kong, then Singapore and for the biggest chunk of time in Thailand. So while I'm passable in my knowledge of Asian cinema and Thai current affairs, I got caught out when someone threw me a few lines from The Castle on my return. I also missed the whole Kath and Kim thing, which I can surely live without from what I've seen. But one of the things I'm now realising I missed out on, to my detriment (but I'm catching up), is the writing of Richard Flanagan. I'd been meaning to jump into Death of a River Guide, which I picked up in $5 Books, but didn't really know much about him or the book. Then more recently I found a compilation of his non-fiction writings called "And What Do You Do Mr Gable?" Most of them have appeared in major newspapers and magazines previously, but as I suspected most were written in the decade I was away. Wow, this guy can write and I can't wait to start his novels. Good to plug at least some of the gaping holes in my book list. NotShort 2.0 . . .
We used to blog here, but looking at the site the last time I posted anything was in 2008. I guess starting a business from scratch will tend to put minor activities like blogging on the backburner -- it certainly did in my case. Of course starting a business and then running it for a few years also gives you a few more things to say, if nothing else, and it certainly has in my case. So let me get this blog thang reworked and refreshed and hopefully I'll be back with a few interesting bits and pieces. Back in five . . . It was back in 2006 that Time magazine declared that "You" were the person of the year for taking control of your digital world, yet for all the hype on user-control there is still a lot "you" cannot do. For example, you can't legally open up and modify an iPhone, at least you can't according to Apple and its legal team. And they're not alone, with many other electronics makers wanting to lock you out of the innards of their gadgets, in the process locking you in to their way of doing things. Phone and internet connections are similarly hobbled. We're only now starting to see so-called "naked" DSL, where you can have a Net connection without having to pay for a phone service you don't want, but it's still fairly scarce. And as a number of friends have found out after moving house recently, when it comes to getting a new phone connection you're still at the mercy of telcos and their antiquated practices. For example, one acquaintance moved into a place where they'd only just hung up the Telstra phone, yet when he wanted to get his own Telstra connection back he had to wait for a technician to come and connect the wires. You'd think that there would be systems in place that would allow for an automated service initiated by the user. But as another vendor friend noted, the whole area of connecting and disconnecting lines is a huge revenue earner for some telcos. And then there's the ability to control your own domain name and the services attached to it. I wrote about my experience with Melbourne IT a few weeks back: how I couldn't change some DNS records so that I could use the free Google Apps services. Despite pleas to Melbourne IT, they would not allow me to change my own DNS records -- something common with most other domain registrars. Since then Melbourne IT has got even bigger, with the acquisition of VeriSign's Digital Brand Management Services (DBMS) business, but they haven't got any more user-friendly. On the contrary, I had many emails from people with similar problems with the company and many requests for getting around them. Thankfully, when "You" are in control you can find a solution. In my case, I initiated a transfer to another domain registrar, one that allowed me to control the DNS settings of my own domain name. The process to transfer the domain was all automated thanks to the enlightened policies of the dot-au domain space and took about 48 hours to come through. The registrar I chose to park my domain name with was Domain Central, mainly because they assured me that I could alter the domain name records whichever way I chose, including pointing them to the free Google App services. In particular, I could alter the CNAME records to point to Google and also change the MX records so that I could take advantage of Google's free email hosting using my own domain. In the process of doing all this, I discovered another user-centric service I like -- web-based live support. Online support is another area that's been hyped over the years but hasn't really been widely embraced. Just think of all the major company web sites you visit and then try to recall how many have live support via chat and so on -- there aren't too many. Domain Central has gone to the other extreme, doing away with phone support altogether and relying on online support via web FAQs, email and live chat. While you might suspect it's simply a cost-saving measure that offers poorer support, I was pleasantly surprised at how effective it was. In my case, I needed help getting the right formats for my DNS records. I clicked on the live support button and within a minute or two I was in a chat session with someone who obviously knew their DNS and how to change the settings to suit my purpose. The guy even did a backup of my records on the spot and sent it to me for safe keeping, then went on to patiently explain what the problem was. The beginning of the end for unlimited Net plans? Given that the average user absolutely loathes pricing based on the quantity of data downloaded, it's interesting to hear that carriers and ISPs in places such as the US, Canada and Japan are considering doing just that. In Japan such pricing is still in the discussion phase, but ISPs there have expressed concerns over an explosion in P2P and video traffic and some see "per-byte" charging as a possible solution. Bell Canada is also looking at its options, according to media reports, which stated that an industry group representing more than 50 independent Canadian ISPs is suggesting that Bell Canada's plans to throttle the web traffic on its networks is part of a larger plan to implement a tiered Internet pricing scheme. And in the US, Time Warner has already started trials in Texas of pricing schemes based on how much bandwidth the user consumes. Users in Australia and New Zealand have long been used to Internet "caps" and associated charges that see them pay for the extra data they download. But in the rest of the world, "unlimited" data plans are taken for granted. There are a number of other countries that have capped data tariffs, but mostly these are outweighed by unlimited plans, as a study by New Zealand's Wairua Consulting found in 2006. NZ had the distinction of having the highest percentage of capped products among OECD countries surveyed, while the study also found that the top three countries in terms of broadband uptake -- Sweden, the Netherlands and Norway -- all "have significantly more choice, faster plans and either no usage restrictions or limits that in most cases are unlikely to ever affect customers." Over the past 12 months I've been a user of both unlimited and capped services and have noticed a massive difference in my broadband habits depending on which I'm using. Using an unlimited broadband connection gives the user the opportunity to embrace the digital world fully, whether that's contributing to or accessing video sites like YouTube, sampling the world's radio stations via the Internet or creating a virtual meeting place on a social networking site. A capped service, as I've experienced the past four months, can see users severely throttling their broadband activity and nervous about experimenting with anything online that might send them over their capped broadband limit and paying exorbitant charges for the excess data. In my case, the cap is 5GB -- a limit the carrier and a few friends suggested would rarely be exceeded. Wrong! I don't consider myself a heavy surfer, particularly of video, but I've still found it easy to exceed the 5GB threshold. One change of habit as an example: I no longer have music services such as Last.FM playing constantly in the background while I work. I also have to be careful of automatic updating services, such as the security and other updates from Windows or application updates from the likes of Adobe. A while back Mark Cuban, tech entrepreneur and owner of the Dallas Mavericks basketball team, blogged about his two favourite technology magazines: one was about the broadband marketplace (www.screenplaysmag.com) while the other was the title Communications Technology (www.cable360.net/ct/). The thing I like most about this blog entry was that I'd never heard of either site/magazine, and given that the recommendation came from Cuban (www.blogmaverick.com), who is himself a compelling read, I (rightly) figured they'd be worth adding to my reading list. Not that I needed any more reading sources -- my RSS reader (if a blog/web site doesn't offer an RSS feed these days, I simply don't read it) has over 100 feeds and normally a backlog of articles in the thousands. As such, I'm in the process of culling my reading list to something of more manageable proportions. Before I do that, however, I thought I'd offer my own recommendations. Herewith, then, are the first five of my top-10 tech blogs and information sources, in no particular order. The second batch will be dispatched in a coming column. TECHDIRT: There are a whole bunch of players that churn out scores of stories per day via a team of reporters, the online equivalent of the quickly-fading IT trade press. They all tend to cover the same stories, all reasonably well, so you really only need one of these on your list. Some of the sites in this category include Om Malik's GigaOM, The Register, Ars Technica, and Tech Crunch. However, the one that I tend to use most is Techdirt (www.techdirt.com), mainly because I find it provides more analysis and context to its stories. The Register would be a candidate, especially as it's not US-centric like the others, but it's not at all friendly towards RSS readers so doesn't make the list. O'REILLY RADAR: Many will have heard of O'Reilly through its books and conferences and may also be aware that founder Tim O'Reilly is credited with coining the term Web 2.0. As you'd expect, the publishing company has a great online presence and practices what it preaches when it comes to social networking and blogging. While there are numerous blogs available on its site, the one I turn to most is its Radar blog (at radar.oreilly.com), which has a range of contributors and is especially strong on its coverage of Web 2.0, social networking themes and emerging technologies. In their own words, "we draw from the wisdom of the alpha geeks in our midst, paying attention to what's interesting to them, amplifying these weak signals, and seeing where they fit into the innovation ecology." TELCO 2.0: If you want insights into future telco business models, then go no further than the Telco 2.0 blog (www.telco2.net/blog), which is produced by research and analysis firm STL Partners. Their Telco 2.0 initiative aims to look at how the telecom industry can make money in an IP world and includes regular brainstorming sessions and conferences around the same theme. While there are some obvious plugs for the conferences and research products, there's also a lot of good information and tidbits from their research results as well as commentary on telco news. Incidentally, I came across this site thanks to the Telepocalypse.net blog of Martin Geddes, who is now part of STL Partners. While Telepocalypse is not updated as often as it was in the past, it's still worth a read. SCRAWFORD.NET: If policy and regulatory matters matter, then try Susan Crawford's blog at scrawford.net. Crawford is on the ICANN board of directors and also teaches Internet and communications law at Yale Law School. Typical topics on the Crawford beat include an in-depth look at the 700MHz spectrum auctions in the US; discussions around network neutrality; goings-on at ICANN and the implications of filtering/blocking. It's telecom regulatory issues through the rigourous mind of a legal practitioner. SILICON ALLEY INSIDER: Remember Henry Blodget? He was the high-flying securities analyst at Merrill Lynch during the heady days before the dot-com crash who later was charged with securities fraud when things went pair-shaped. Whatever you think of the guy, he's certainly abreast of what's happening in the digital world and you can now catch up with his regular analysis at Silicon Alley Insider (www.alleyinsider.com). Blodget is one of the three founders of the site/blog, which was started last year and seems to be expanding rapidly, with commentators from the likes of Forbes and Variety added to the roster. It's a site that goes well beyond straight news and a must-have on any high-tech reading list.